"The company, best known for its cameras and voice recorders, just brought those two worlds together by announcing the LS-20M, a handheld whose relatively high-end audio specs should help it go toe-to-toe with Zoom." As tiny as electronics are these days, we are finding companies willing to mash together all manner of gadgets into one. 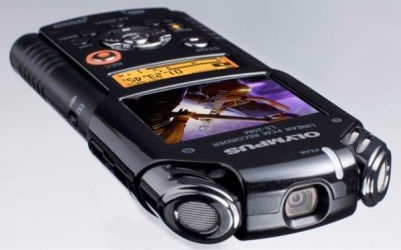 You would think that with all those mp3 players, iPods, iPhones, iPads, Androids, Playbooks and Flips that this Camcorder and Voice recorder hybrid would not stand a chance. Well, it might not. But, if its audio recording fidelity is any good, and it focuses on ease of use, I can see some potential. Not everyone wants to have to swipe, mash, swipe, swipe, mash, mash their way to recordings.